Yulia Skripal Issues Statement, Declines Help From Russian Embassy : The Two-Way The 33-year-old daughter of Russian ex-spy Sergei Skripal, both of whom were poisoned by a rare nerve agent, also pushed back on public comments made by an outspoken cousin in Russia. Yulia Skripal, the daughter of former Russian spy Sergei Skripal, in an image taken from her Facebook page on March 6. "I have access to friends and family, and I have been made aware of my specific contacts at the Russian Embassy who have kindly offered me their assistance in any way they can," Yulia Skripal said in a statement issued through police. "At the moment I do not wish to avail myself of their services, but, if I change my mind I know how to contact them." She said she was not strong enough to give a full interview yet but added that until she is ready, "no-one speaks for me, or for my father." 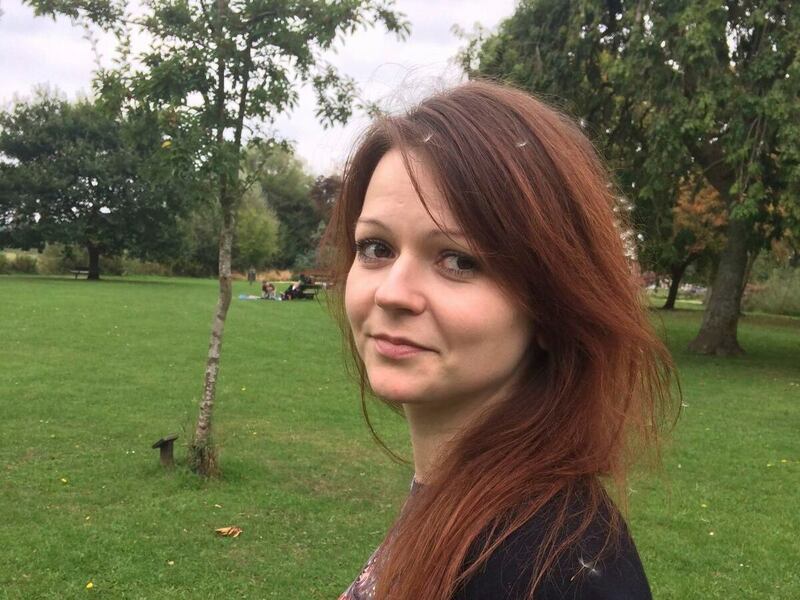 Skripal, 33, was found slumped on a bench in Salisbury on March 4 along with her father, Sergei Skripal, a former Russian intelligence officer who was convicted in Russia of charges of spying for the West and came to Britain as part of a prisoner swap in 2010. The two were later found to have been poisoned by a type of military-grade nerve agent first developed in the Soviet Union in the 1970s. London has accused the Kremlin of trying to assassinate Sergei Skripal as an example to other potential defectors, a charge Moscow has strongly denied. The case has sparked international outcry and set off a diplomatic row resulting in the expulsion of dozens of Russian diplomats from the U.S. and NATO member countries, and a reciprocal response from Moscow. But her statement on Wednesday did little to satisfy the Russian Embassy in London, which has repeatedly requested access to her and accused British authorities of abducting her. After her release from the hospital on Monday, officials said she had been taken to a "secure" location. "The text has been composed in a special way so as to support official statements made by British authorities and at the same time to exclude every possibility of Yulia's contacts with the outer world — consuls, journalists and even relatives," the Russian Embassy said in a statement, adding that her statement "only strengthens suspicions that we are dealing with a forcible isolation of the Russian citizen." In her statement, Yulia thanked the medical staff at Salisbury District Hospital who had cared for her before her discharge on Monday. "I have left my father in their care, and he is still seriously ill. I too am still suffering with the effects of the nerve agent used against us," she said. "I find myself in a totally different life than the ordinary one I left just over a month ago, and I am seeking to come to terms with my prospects, whilst also recovering from this attack on me." In recent days, Skripal's cousin, Viktoria Skripal, has weighed in on the case after being refused a British visa to visit her in the U.K. Last week, Viktoria released to Russian media a telephone conversation she said she recorded between her and Yulia, while her cousin was still in the hospital. In interviews with Russian media, Viktoria has also suggested that British authorities asked her to denounce Russia as a condition of receiving the visa and that London denied her request because it has "something to hide" about the poisonings. A spokesman for Britain's Home Office says Viktoria Skripal's visa application "did not comply with the immigration rules," an explanation the Russian Embassy said was "disappointing" and "politically motivated," according to Sky News. "I thank my cousin Viktoria for her concern for us, but ask that she does not visit me or try to contact me for the time being," the statement quoted Yulia as saying.